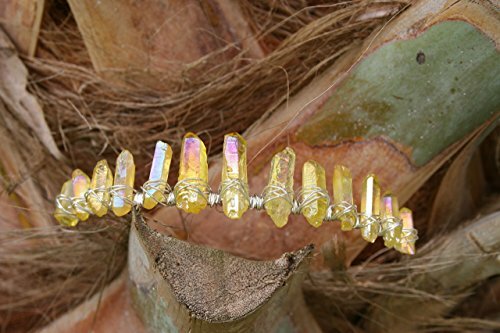 Sunshine aura Quartz Crystal crown! 13 aura Quartz crystals wrapped in silver wire and attached to a steel metal headband. Beautiful and lightweight crown or headband. Shines beautifully in the sunlight. Accepting custom orders! Perfect for weddings, prom, cosplay, festivals and many other special occasions! ***Please note these are real crystals and therefore an organic natural material and have different shapes, no two are the same. Your crown will look as close to the photo as possible but may be slightly different. I always put the tallest Crystal in the middle. *** Sunshine Aura Quartz - Clear Quartz bonded with Gold and Platinum; creates a bright yellow crystal with an iridescent gleam. Its energy is powerful and extremely active, wonderful for stimulating and cleansing the Solar Plexus Chakra. It heals old hurts and traumas, and overcomes a sense of disappointment with life, or bitterness at the lack of opportunities. Placed in the center of any healing crystal layout, Sunshine Aura infuses the whole system with health and energy. At a spiritual level, it is expansive and protective, inspiring optimism, natural joy and spontaneity. It encourages laughter and releasing one's inner child. Sunshine Aura is considered powerfully positive for removing toxins, relieving constipation and aiding digestive issues. It is thought to be most beneficial in assisting treatments for the pancreas, liver, spleen, gall bladder and the nervous system. It helps to bring the body into balance, and may be used in treating Seasonal Affective Disorder and to aid absorption of vitamins A, D and E.
If you have any questions about this product by Heather Feather's Design, contact us by completing and submitting the form below. If you are looking for a specif part number, please include it with your message.